Wexford isn’t just blessed with the best weather in Ireland, but some of the country’s best golf courses also. 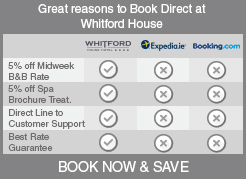 Whitford House Hotel offers the best golf packages in Wexford that are individually structured to include accommodation, meals and specially discounted green-fees at many local golf courses (subject to availability). Check out the latest Special Offers in Wexford for golfing trips today.